Doctors in Vietnam carried out drastic measures to save a man who was suffering from alcohol poisoning last month. They pumped 15 cans worth of beer into his body. While the action may seem counter-intuitive, it was necessary to keep him alive. 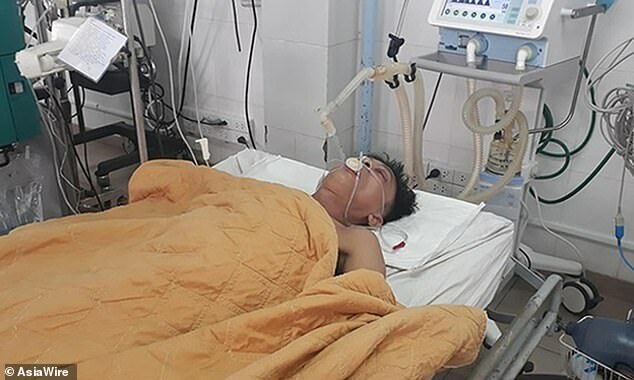 On Dec. 25, Nguyen Van Nhat, 48, fell unconscious and was transported to a hospital in Quang Tri province. Doctors quickly determined that the levels of methanol in his body were 1,100 times more than the recommended limit, according to the Daily Mail. Methanol is a highly dangerous form of alcohol. Dr. Le Van Lam and his team at the General Hospital’s Intensive Care Unit immediately gave Nhat three cans of beer, or about 1 litre, to keep him alive. Throughout the day they transfused a total of 15 cans of beer (about one every hour). The treatment caused the man’s liver to slow down the rate at which it processed methanol. Ultimately, Nhat regained consciousness. Ethanol and methanol are two types of alcohol that are both toxic to humans. Methanol is much more dangerous because the body doesn’t process it as well. Most alcoholic beverages contain ethanol, not methanol—which is more common in products such as gasoline, antifreeze, paints, thinners, and bootleg liquor. When an individual has a drink with ethanol, the body uses an enzyme called alcohol dehydrogenase to break it down into acetaldehyde, which is a carcinogen. The body then turns it into acetate before breaking it down into water and carbon dioxide and eliminating it. The body metabolizes methanol, which can be fatal in smaller doses, differently. First, it is turned into formaldehyde before being broken down into formic acid. These compounds can cause methanol poisoning, which can result in permanent blindness, nervous system depression, and even death. By giving the patient beer, it prevented the formaldehyde from turning into formic acid. This enabled the doctors to perform dialysis and thoroughly remove the alcohol from his system, according to Newsweek. Nhat was released from the hospital three weeks after he was admitted.